Fermilab’s Lia Merminga talks to Symmetry about her early experiences in STEM and her drive to solve science’s unanswered questions. At just 16 years old, inspired by family members, a great teacher and a book about Marie Curie, Lia Merminga knew she wanted to become a physicist. In college, she decided to pursue research, moving from Greece to the United States and completing her PhD thesis at the Tevatron particle accelerator at the US Deparment of Energy’s Fermi National Accelerator Laboratory. 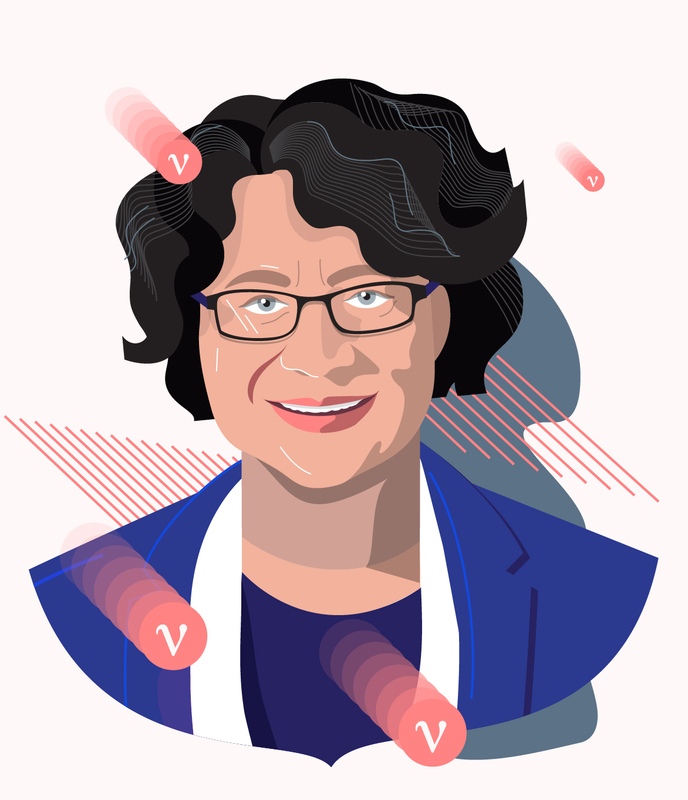 She has since become an accomplished scientist and leader, managing particle accelerator projects at Thomas Jefferson National Accelerator Facility in Virginia, TRIUMF in Vancouver and SLAC National Accelerator Laboratory in California. Merminga returned to Fermilab in Illinois to assume her latest role—directing PIP-II, the first international particle accelerator project to be hosted in the US. She says the hustle and bustle around the lab reflect her drive to pursue unanswered questions about the universe. She hopes the efforts she is helping with at Fermilab will yield Nobel Prize-caliber research into fundamental particles called neutrinos. Sarah Lawhun of Symmetry talked to Merminga about her career in physics, about her new role and a little bit about herself. As a child, do you remember being interested in math and science? My first realization that I liked STEM fields was when my uncle, who was an electrical and mechanical engineer, lived with my family. He would come to our house with his colleagues. They would spread out all their drawings on our dining room table. I was so fascinated by the work he was doing. These drawings and visual creations really appealed to me, so the first thing I wanted to do was become an architect. What were some of your other early STEM-related experiences? Another major milestone was when I was 13. On my birthday, my friend gave me as a gift the book of Madame Curie’s biography by her daughter, Eve Curie. I read it at exactly 13 years old, and I read it multiple times. I was fascinated by Madame Curie’s life, so I decided that was the kind of life I wanted to live. I wanted to devote myself entirely to science and pursuing problems that were not solved. It sounded amazing to spend your entire life contemplating the research you’re doing and your discoveries. To me, this was a life worth living. As a 13-year-old, it had a tremendous effect on me. Growing up I heard stories about my other uncle who had a PhD in physics from Columbia University. He was legendary in our family for his contributions to science. When I was a kid, my grandma told me stories about him. Eventually, during graduate school, I looked up some of his papers and found out he had worked with Charles Townes and A.L. Schawlow, both Nobel Laureates. Then, in high school, I had a teacher who was very good at teaching as well as a great physicist. She inspired me even more. My experience with her really solidified my idea that I wanted to study physics. All of these things shaped my direction in life. By the time I was 16, I knew I wanted to study physics. Throughout my life, I have always enjoyed math. Using the mathematical language to describe physical phenomena was exactly what I wanted to do. What first sparked your interest in physics research? I went to the University of Athens and studied physics. Around my third year, I decided I wanted to do more. It wasn’t enough for me to just work in physics. I realized I wanted to push the frontiers of knowledge and go beyond what’s in the books, working on problems people didn’t have answers to yet. I always was very critical, I must say. Our teachers in Greece told us that we had to develop our critical ability, rather than just memorizing. When I saw a problem, I would ask multiple questions from different points of view. Some of the questions, it turned out, didn’t have an answer. What did you do once you knew you wanted to pursue research? I decided to pursue graduate studies in physics, so I applied to US universities. I was accepted to the University of Michigan in Ann Arbor. There I pursued a master’s degree in physics while I was looking for a PhD thesis topic. In the meantime, since I liked math all along, I got a master’s in math as well. I just kept taking courses because I was interested and pretty soon had enough to get a degree. As I finished my master’s in math, I was at Fermilab working on my PhD thesis on the Tevatron. Tell me a bit about your first time at Fermilab. It was when Helen Edwards was head of the Accelerator Division and the Tevatron was being commissioned as a collider. My experience left some indelible marks on my mind. I saw Helen day and night, and on weekends. Every single day of the year, she was here. She was always monitoring the Tevatron’s progress. She was an inspiring and strong leader. Coming from a university environment where I spent three and a half years, to a lab, where I spent two years, I found I just loved the lab environment. To get to my office I had to pass in front of the control room, where there were people working 24/7. Here, there’s always something going on, which is what I love about the lab. Since then I’ve worked in labs. I’ve maintained a passion for teaching as well, and I taught accelerator physics every year at the University of British Columbia when I was in Canada. I just couldn’t change how much I loved labs. Where are you hoping the lab will go as a whole in the foreseeable future? There is a grander mission here. We are exploring unanswered questions about the universe. Firstly, the lab will become the world leader in neutrino physics. Once we bring in PIP-II and increase the intensity of the neutrino beam, and bring online the powerful particle detectors of LBNF [Long-Baseline Neutrino Facility] and DUNE [Deep Underground Neutrino Experiment] in South Dakota, Fermilab will be an undisputed leader for neutrino physics experiments. PIP-II is also breaking new ground. In our field, PIP-II is the first US accelerator project that’s done with significant international in-kind contributions. This is a new paradigm in how the US is executing accelerator projects. As projects become more expensive and complex, collaboration becomes inevitable. What we’re doing will undoubtedly be modeled by future US accelerator projects. We’re setting up processes and sorting out wrinkles so our model can be used for the next generation of projects. It comes at a price, because there are many things that we are working out for the first time. We don’t have an example to follow, so we have to come up with our own solutions. It’s a challenge, but solving it will help facilitate similar projects in the future. More broadly, an essential direction for our lab is becoming a leading center in accelerator science and technology. Fermilab’s pioneering advances in superconducting radio-frequency technology and beam physics form the foundation of PIP-II and future upgrades to the lab’s accelerator complex. I envision these challenging projects and related R&D to push the frontiers of accelerator physics even further. I hope that not only Fermilab will become the world leader in neutrino physics, but its research will be Nobel Prize-worthy. Ultimately, PIP-II will lead to discoveries that shed new light into our understanding of the universe and answer some fundamental questions that to date remain unanswered. Besides science, what are some of your passions or hobbies? I really like hiking but haven’t gotten to do that in a long time. I also like to travel with my family, and read books. When I have time, I go to see ballet and musical performances. Recently, I was in Prague with my husband, and I really enjoyed that. When I get the opportunity to visit a new city or a foreign country, I take it. I like to embed myself in new cultures. Traveling without working, when I have the time, is something I treasure a lot. I know that every mom is proud of her children, but I have a son I am very proud of. I love to talk with him about both his subject and mine. He’s majoring in psychology at UBC. My husband is also an accelerator physicist. We like to talk about physics, philosophy and other related topics. It’s one of my great pleasures to have us, two physicists, talking with our son, a psychology major. What is your new role like at Fermilab, and what do you do day-to-day? Since I’m relatively new at the job, I’m trying to wrap my arms around the project by reviewing and revisiting all aspects. I’m reviewing the scope, schedule, budget and the international contributions. Much of my thinking goes into strategic planning. How do we advance the different elements of the project in a balanced way so that we keep our international partners engaged and stay in sync with them? We are interdependent: Our partners depend on us and vice versa. The role feels natural to me sometimes. My team is amazing, too. We’ve put together the A-Team. Everyone is so strong and highly qualified, as well as passionate about the project. I’m very grateful to have so many amazing people working with me on the project. I’m also grateful for the work that Stephen Holmes and the team have done to bring the project to this point. It’s a large-scale scientific project and is highly complex—a challenge I want to face. Working through challenges is enticing to me.